On January 30 (JST), it was announced that one of the most successful movies of 2012 - 'Thermae Romae' will be receiving a sequel in 2014! 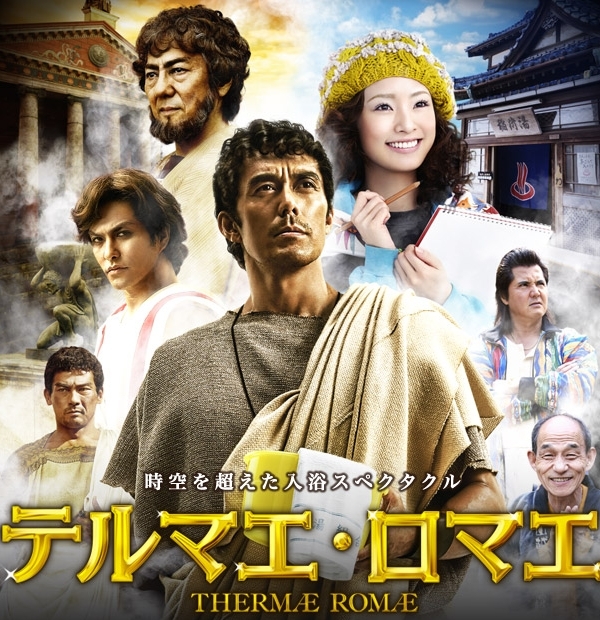 All the main actors from 'Thermae Romae', lead by Abe Hiroshi as the protagonist will be reprising their roles in 'Thermae Romae II', which is slated for release during the Golden Week of 2014 (early May) and will be directed by Takeuchi Hideki again. The filming will take place in Bulgaria, a first for a Japanese movie production, and it will include a movie reconstruction of the Roman Colosseum in actual scale. In 'Thermae Romae', Abe played Lucius, a bath design engineer who slips through time between Ancient Rome and modern Japan. This comedy became one of the highest grossing films in Japan in 2012 with a revenue of 5,980,000,000 Yen ($65,959,400 USD). Lucius is going to face another tough challenge in 'Thermae Romae II' as he gets ordered to construct a thermae (bath house) inside the Colosseum. When he accidentally slams into a wall with his head, he once again travels to the future and awakes in modern Japan. Abe already stated his excitement and that he can't wait to start working on the sequel. Ichimura Masachika, Kitamura Kazuki, and Shishido Kai will once again portray the 'deep faced' characters of Ancient Rome alongside Abe as Lucius. The 'flat faces' of modern Japan will be played by Ueto Aya, Takeuchi Riki, and Sasano Takashi again. Additional characters and more details about the sequel will be released at a later date. TRF reveals details on their new mini album + PV for "PUSH YOUR BACK"
Check out the PV for Ayaka's "Chiisana Ashiato"!